Less than Half Price plus Add auto jigglers for only 9.95 - Save a bunch! This 20 piece lock picking tool set fits into a shirt pocket. The lock picking tools included are the standard choice of the industry. Each lock picking tool is made of hard finished clockspring steel, tempered to the correct degree of hardness. Perfect for wafer, six or seven pin tumbler locks. 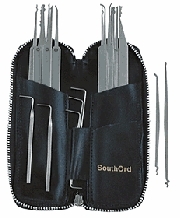 This 20 piece lock pick set includes fourteen assorted picks (six with stainless steel handles), a broken key extractor, and five tension tools, all packaged in a luggage quality zippered case. The variety of tools is great to give you options for different types of locks, but also you can see which tools work fastest for you on the same types of lock.